Many of our modern vegetables were developed from wild plants during the Roman Empire and later-day Italians through traditional crossbreeding techniques. This process involves taking pollen from one plant and placing it on the flowers of another to produce a hybrid. The goal in many cases involved removing undesirable traits, such as extreme bitterness or small size, or accentuating positive traits. Crossbreeding is much different than genetic modification through the insertion of genetic material to produce an entirely new trait. A new form of broccoli rich in beneficial compounds known as glucosinolates has shown impressive results in two clinical trials in humans in lowering LDL cholesterol levels. There are several ironies about this “super” broccoli with the first one being that the researchers created this natural hybrid by going back to the wild form in Southern Italy rich in glucosinolates. The modern broccoli is one of the most nutrient dense foods. It is especially rich in vitamin C. A one-cup serving a broccoli provides about the same amount of protein as a cup of corn or rice, but less than one-third the amount of calories. Broccoli also contains the carotenoid, lutein. Broccoli is an excellent source of the vitamins K, C, and A, as well as folate and fiber. Broccoli is a very good source of phosphorus, potassium, magnesium and the vitamins B6 and E.
Broccoli, like the other members of the cabbage family, broccoli is demonstrating remarkable anticancer effects, particularly in breast cancer. Compounds in broccoli known as glucosinolates (specifically indole-3-carbinol and sulforaphane) increase the excretion of the form of estrogen (2-hydroxyestrone) linked to breast cancer. Preliminary studies suggest that, in order to cut the risk of cancer in half, the average person would need to eat about two pounds of broccoli or similar vegetables per week. With the new form of broccoli this level of protection against cancer could be provided by eating 1/3 this amount. 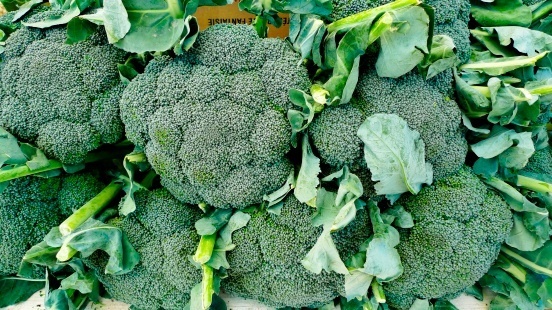 This new “super” form of broccoli was developed at two world-leading research institutes in the UK, The Institute of Food Research and The John Innes Centre, to be approximately 3 times higher in glucosinolates (specifically glucoraphanin the precursor to indole-3-carbinol and sulforaphane) that typical broccoli. This broccoli, Beneforté, was developed through conventional breeding techniques, crossing a wild broccoli variety into commercial breeding lines to produce a broccoli variety that has all of the characteristics consumers, growers and retailers want in broccoli, but with the added benefit of the higher levels of glucoraphanin. Beneforté broccoli is now a commercially grown crop and is available in Europe. The studies involved 130 volunteers who were assigned to consume either 400 g of standard broccoli or 400 g of Beneforté broccoli per week for 12 weeks. In the first study consisting of 37 subjects, the Beneforté broccoli diet reduced plasma LDL cholesterol by 7.1 percent, whereas standard broccoli reduced LDL by only 1.8 percent. In the second study there with 93 subjects, the Beneforté broccoli diet resulted in a reduction of 5.1 percent, whereas standard broccoli reduced LDL by 2.5 percent. Because of the small sample size, the results had to be combined to reach statistical significance. When both studies are combined, the Beneforté broccoli lowered LDL cholesterol by roughly 6% while the standard broccoli lowered it by 2%. This difference mirrors the three times greater concentration of glucoraphanin in the Beneforté broccoli. Here is another irony of this story. Beneforté broccoli is produced by the seed giant Monsanto. What is the irony? Most people are aware that Monsanto is the leading developer of genetically modified foods and producer of pesticides, but here they are marketing the Beneforté broccoli with the claim that it “helps maintain your body’s defenses against the damage of environmental pollutants and free radicals.” Interesting? As consumers, we are going to have to make choices that influence big companies. With Beneforté broccoli, I really don’t like the idea of supporting Monsanto, but I do like the idea of using natural breeding techniques to improve our food supply and the health benefits of foods. Will I buy Beneforté broccoli and similar foods produced by Monsanto when they eventually find their way to the US? And, will you?